I love these beasts and I’m thrilled when I see one – although as they’re noctural, I’m as likely to step on one or drive over one as opposed to catch sight of it with a torch when the dog is getting his last thing in the evening walk. 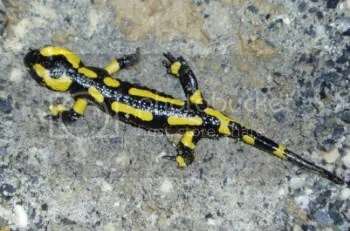 Fire salamanders aren’t found in Britain. It’s not that they are particularly demanding or rare creatures – woodland, damp moss and dead leaves, a stream or two or ponds and they’re happy. They just didn’t make it north far enough or fast enough after the last ice age (that would be the one before the winter of 2009 / 10) and the British Isles declared UDI and broke off (geologically!) 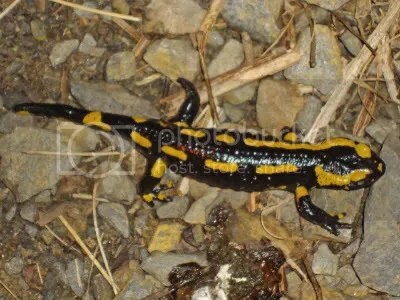 from the European mainland before the fire salamander arrived to colonise. Nowadays they’re found throughout Europe as far north as Denmark but because we don’t see them in Britain – and because they look like a shiny black lizard that had an extravagant encounter with a flourescent marker – they seem rather exotic to me. Their stripes also come in darker shades of yellow to orange and are unique to an individual. These photos are of three different individuals and if you compare stripes, they’re all different. This salamander above looks quite “tubby”. It is possible it was a pregnant female heading for running water – streams or ponds are ideal – where she will give birth to “tadpoles” that are ready to swim off and start their lives independent of her. S/he is missing a foot off one of her back legs and possibly one of the toes on her front leg but watching her set off for the safety of a pile of rocks, it didn’t obviously impede her movement. 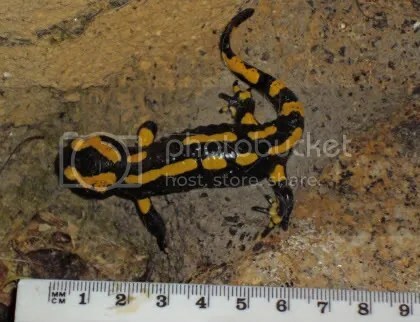 Fire salamanders can measure up to 25 – 28 cms in length. This one from nose to tail would be about 15cms. They can protect themselves from predators by use of glands which run down the body and secrete nasty tasting chemicals to dissuade predators from eating them. They can also spray the chemicals at predators if they are under threat. The virulent stripes provide a visual warning too. They eat slugs, earthworms, insects, larvae and other snacks and the salamander larvae will eat whatever they can find in a pond that isn’t intent on eating them. Metamorphsis from the water-based larval stage occurs after 3 – 5 months at which stage they can begin to live on land. They are noctural and tend to be most visible on rainy or damp nights. In colder regions (I think Normandy qualifies) they will hibernate between October and March, depending on temperatures.